I tried many margin calculators. By far this one was the best. Being in sales I deal in margins every day and graduated from old school profit margin calculators to excel spreadsheet to now this slick app. Thanks for a great app that does exactly what I need. Please increase the font size of the numbers on the next update. 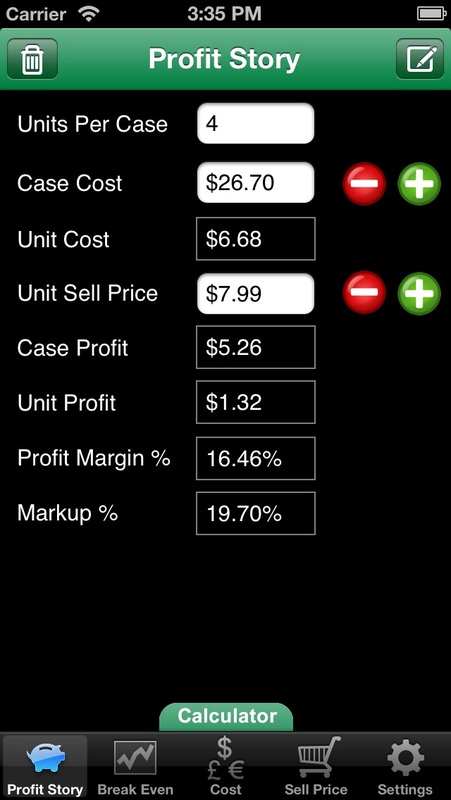 This is the best margin and profit app available. Simple. Easy. Impactful. This App shows you and your customers only what is needed, nothing more, nothing less! If you want to show profit or margin or break even scenarios; buy this App. I find Profit Story to be one of those "must have" apps for anyone in sales and marketing. 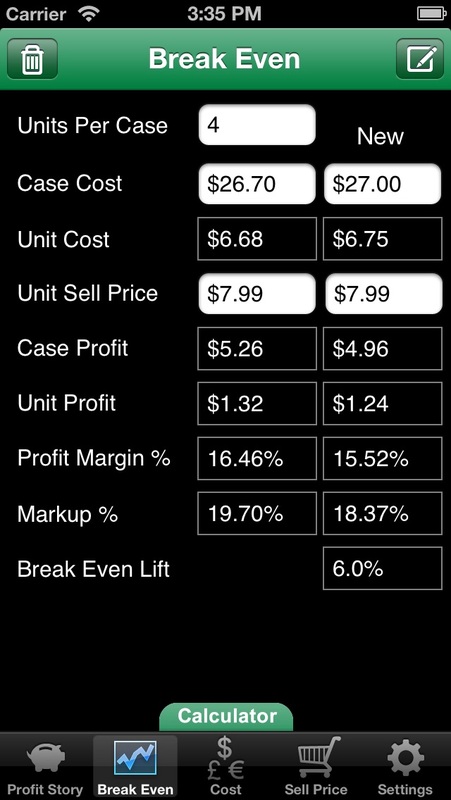 Unlike other apps, it allows the user to choose between units of measure and it's profit wheel immediately shows the effects of the various parameters when scrolling. Thanks guys...I'll be looking for more apps from you! This app is a quick and easy way to power through presentations were buyers are stammering around commitments on price points and break evens. Easy and fast. I highly recommend. This app is the perfect tool for anyone in sales or for anyone that owns their own business. 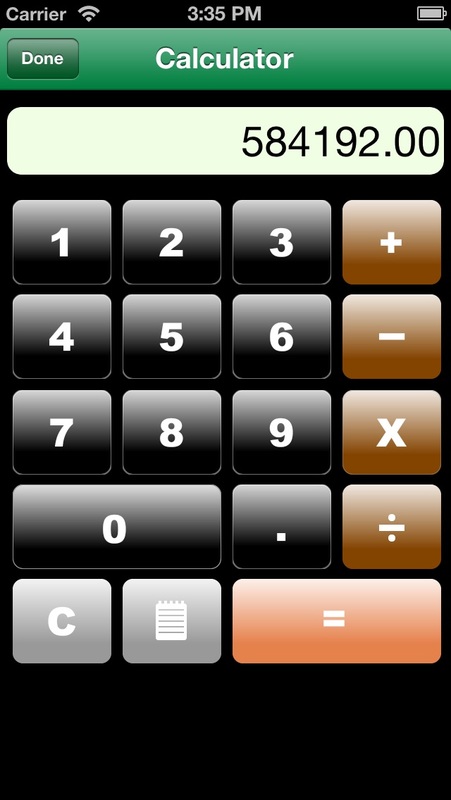 The calculations are quick and easy to use. 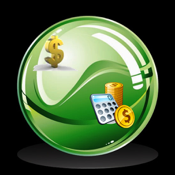 It allows you to look at several different pricing scenario's with ease. Thanks for the great app! 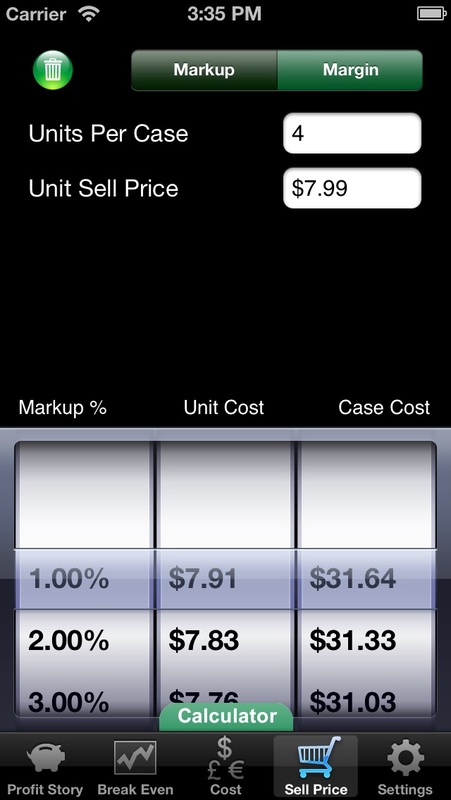 This App works great and gives a sales person a simple tool to do profit math. It almost makes it fun. Great App! Limited variable input. Does not provide method to calculate mark-up need to achieve margin. Nice, I use it to check on quotes or closed jobs for mark up and profit. Would be nice if there was a window to type info. To support the numbers and an option to include or take a picture as a well. When moving to email it only moves the numbers, not the profit story as seen on the screen. I click the screen and save the picture for later use. A very useful app to enable quick pricing of goods. It would more in tune more with how pricing is done, with the focus on gross profit percentage; allowing input of cost AND gp% desired. Then use the wheel ( I like that) to fine tune the sell price. Great app! Helps to quickly close the deal. I would recommend this to everyone into sales and money. It tells you the breakdown of net profit/costs/break-even analysis of a single sale very easily and quickly and also includes a few other tools that I would rarely want to use. I was hoping for a lot more out of a $2 program. How about a back log? Emailing the results to myself is hardly an answer for that. I've tried many apps for markup. This one works the best for me. Best pricing app ever and I am a pricing analyst! Brilliant concept and presentation. However it lacks a few basics *Pros want to input numbers with a number key pad, not the normal keyboard *Can't copy and paste numbers *Can't enter in unit cost, only case cost. It would be efficient to be able to enter either and let it calculate the rest If I had these things, it would be efficient enough to use in my everyday sales presentations. For now, it was $2 spent on hope. 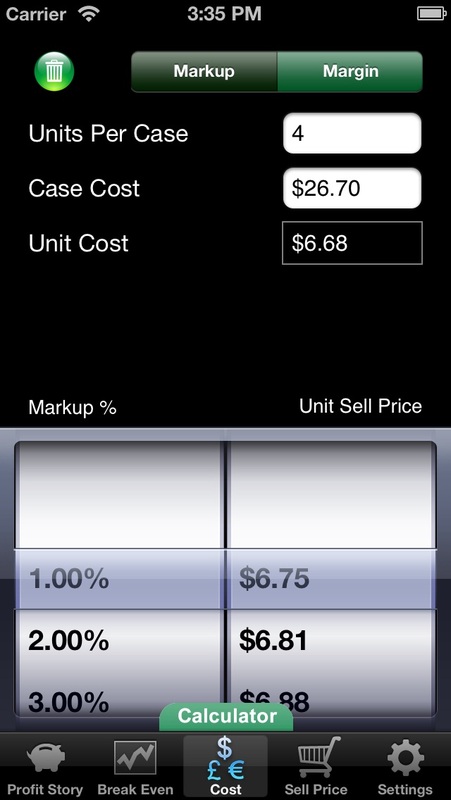 This app makes it easy to view and share margins, markups and break evens quickly and easily! Best profit calculator app out there.